Since 1983, Stark Glass Blocks staff of production, sales, installation and customer service associates have been trying and testing new products and ideas for the glass block industry. That steady drive of this family owned business has resulted in the distribution of glass block from all major manufacturers; as well as, the manufacturing and fabrication of many innovated new products like Curbstile and the Eazygrout Glass Block Panel System. 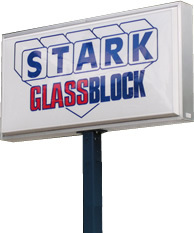 Stark Glass Block distributes nationwide directly and through our ever expanding network of authorized dealers. At Stark Glass Block our goal is to give you selection, satisfaction and security. Our selection of glass block ranges from style, shape and color. Your satisfaction is guaranteed and the security of unbreakable glass block windows gives you peace of mind. Our knowledgeable staff is always on hand to answer your questions and give you unbeatable customer service. We want to provide you with the beauty and security of superior Glass Block, Glass Block Windows, Vinyl Wrap Windows and Glass Block Showers. "It has and always will be our policy to only market products and provide services that meet or exceed customer and consumer requirements and expectations, and are discernibly better than our competitors."